O great! Just what I wanted to here. Thanks Rook, I can't wait for next year, it was a great experience. come on who's up for some pity votes my way? Okay, that is just not possible. I'll be voting for you man. You did a great job, just hate to see you go down this quick. If only girls gave out pity ... errr. I'm definitely voting for all four of you. Oh man! The too bad, I really like your ship. Best of luck. Even if I make it past this round I'll be going up against one beast I believe will leave a trail of ships destroyed on it's way to the final four. Location : Anywhere with lego. I'm glad I don't have to go up against him... yet. Here's the scoop! Go vote! Rook wrote: Here's the scoop! Go vote! If I win the next two rounds I'll be up against the Arkose VII. Here’s my predictions/hopes. In some cases I hope I’m very wrong. For example I think my best case scenario is 4th place. I want to be VERY VERY VERY wrong! Si-MOCs do not leave the house today! Luck is not on your side today. I truely hope you crush him, so that the rest of us might have a prayer at 1st! Besides he probably already has UCS SSD! I still think his ship looks micro scale. I actually think LB's has a good chance to win it... 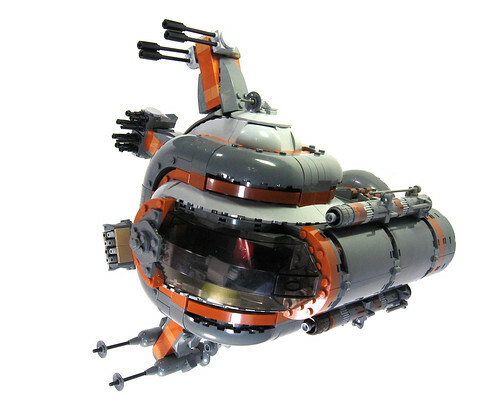 But that round orangey ship that Knight showed us looks really sick I'd like to see how he built that. Location : Vancouver, BC Canada. GO CANUCKS GO! Who’s, Tyler's? Yeah there's something off about it for this contest. Don't get me wrong it is the best or second best ship personally. But you're right, it doesn't fit the contest requirements for me either, thus I did not vote for it. Any ship that you can't see the pilot in, is a no for me. A bounty hunter that relies on sensors only is a dead bounty hunter. LazerBlade wrote: I still think his ship looks micro scale. It really does look more like a microscale capital ship then anything smaller. Proportions make it more ISD size. the only way I can see me moving on is if there was an organized effort to make him lose so that people don't face him later. Yeah - I think almost all SW ships have some sort of window right? it seems pretty basic SW 101. Though it brings up that debate of what make a SW ship SW-y? some of these I would rank more Sci-fi than SW.
Don't get me wrong, I love the whole geometry feel to it, I don't like the fact that the pilot has no windshield other then the 2 2x2 slope bricks. Only reason he gets votes is because folks are parcel to him and or they like geometry. 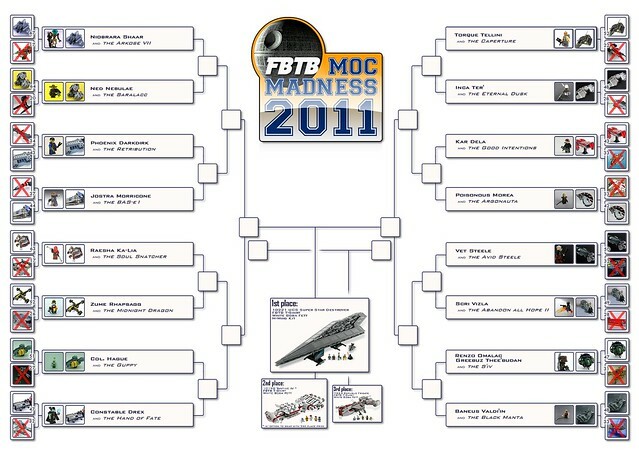 So Si-MOCs has my vote. Arkose VII and the Bombad Barracuda have a 50/50 chance, so it's going to be a long 3 days of nail biting. Results from Round of 32! Sweet 16 POLLS are up! AH CRAP! Only one CABGer remains! Nah we just had better rivals. It all came down to who we got paired against. LB was a better ship but not as Star Wars-ish as his competitor. I think we all knew Si-MOCs was toast against Tyler (and any of us would have been). Be the results of this round I would have had the best chance against Tyler but I think I would have also been burnt on this on. Knight built a good ship I think his opponent’s was clearly better. CABGO would be every two years, with the Olympics. And that will be CABGOIII! I guess that`s just some bad luck about who you`re paired up against then because some of the ones that got eliminated were pretty good. I'm pretty happy with the result it was a lot 'closer' than I thought. 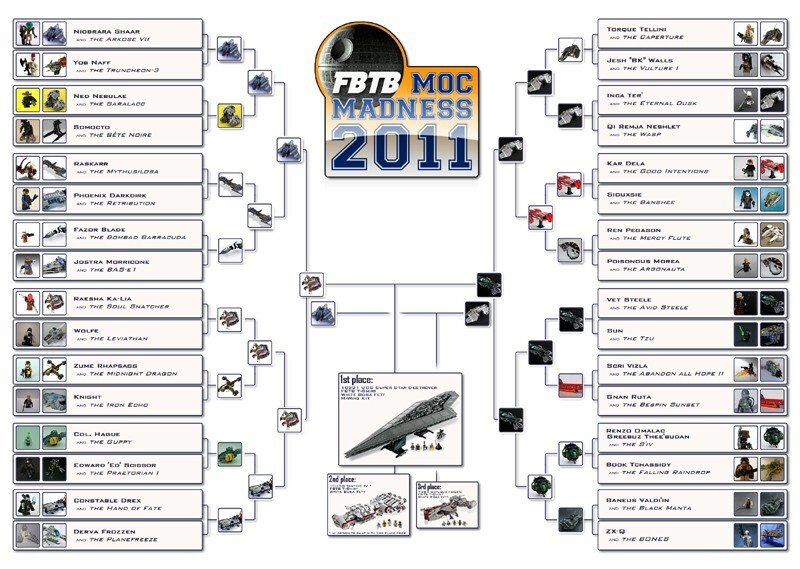 Though for next year i Think I have to pay WAY more attention to the shot that they use for the brackets - my ship and fig weren't the best presented - things to think about. Customizers And Builders Guild Olympics. CABGO is 3 leveled contest, kind of the decathlon in the Olympics is a 10 part event. I believe we have summer Olympic this year. So June, July, August. June = Everyone builds [BLANK] Vote: top 20 do next level. July = Top 20 builds [BLANK] Vote: top 10 do next level. August = Top 10 builds [BLANK] Vote: winners get prizes. Usually about 5 or more us toss in a prizes. Everyone that can, enters. Last time we split up the into categories: Non-Guildies, Guildies, & Staff because traditionally our staff are our best customizers and builders. This gives the other members a better chance at winning by forcing some the better builders to battle each other. However last time I was only staff that entered so we'll probably look at more prizes for fewer categories this next. But it hasn't even popped up in the staff area yet. Hopefully we can get some good sponsors. MikeZ, EclipseG and several other Guildies and Staff have provided some great items in the past. We've also had BrickArms toss a small bag of goodies too. I'm usually good for a couple impulse to small sets. Now with Fairview Store I might be able change my usual prize list.